I AM 28 YEARS OLD AND I HAVE BEEN WORKING AS A DIGITAL CREATOR FOR 5 YEARS. My role is to create digital projects with new concept in which the user is fully part of the experience. I am very focused on the user. I never forget that what I am creating is not only for myself. I can’t stop looking at people and try to understand their behaviours. I try hard to give a brand new feeling in every single creation. I love to create attractive, intuitive and emotional user interfaces. I keep myself updated on what competitors and other digital leaders are doing to improve the user experience and to deal with its evolution thanks to innovative projects. I organize the structure and information from a user point of view, to make sens to him. The objective is to ensure that the right information is presented in the right way, in the right place, at the right time. I identify, clarify, and organize requirements: a set of possible sequences of interactions between systems and users in a particular environment and related to a determined goal. Support production teams by providing mentoring and feedbacks about the execution of day-to-day activities. I coordinate end-user research efforts, build prototypes, and conduct tests to validate designs thanks to customer feedbacks. I always look for new technologies and new concepts." "I am Involved when it comes to work in a team. Pro-active, with the will and energy required I’m able to lead projects." "Passionate about my work, I constantly improve my knowledge. I want to keep on working with differents profiles and learn even more."
. Create wireframes and visual design mockups as needed to effectively conceptualize detailed interaction behaviors.
. Incorporate user needs collected during User Research, into the designs.
. 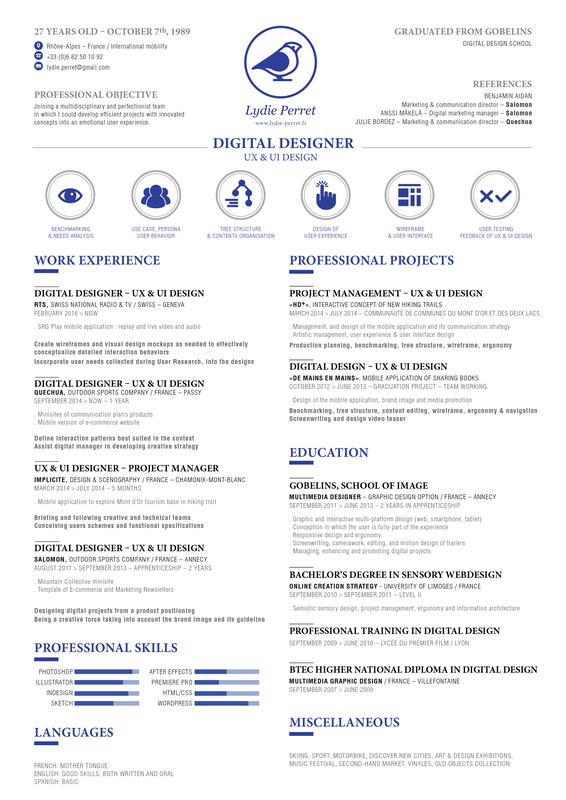 Assist Digital manager in evaluating objectives and developing creative strategy.
. Create design of digitized images.
. Logos of Salomon FreeskiTV & RunningTV 2013.
. Template of E-commerce and Marketing Newsletters.
. Manage, design and follow up Advanced Product Pages.